So, Beezee has tipped me off to this one. Looks like a pretty banging event to be fair. So i was thinking, if anyone from the UK was interested in a forum user meet up, this would be a good place to do it! beat me to it chip lol, yeah this is the event ive been longing for for ages, its got so many great acts playing, of course the proteus finrg set is just making my hair stand on end thinking about it but also ephexis live (providing they stick to the darker stuff), the return of A+D+A+M lab4 doing a b2b with kohl, not freeform but dark hard industrial shizzle bizzle. Wish i could be there.. and some day i will travel uk and somebody has to show me some proper event's on there.. Thanks for putting this up guys! 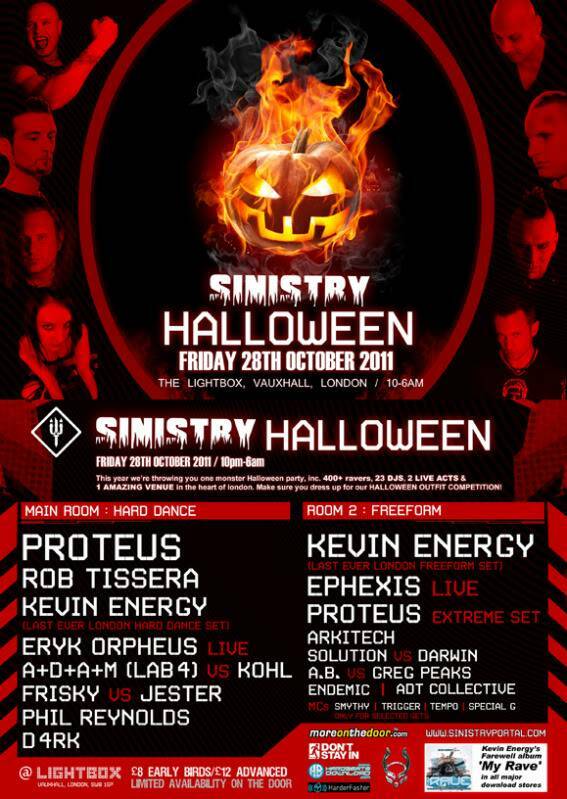 At SINISTRY:HALLOWEEN, we present to you a scene legend that\'ll be playing his final 2 sets in London, an International headliner playing 2 very different sets, 2 Live Acts, 2 very special “VS” sets and some of the biggest names in Hard Dance & Freeform! 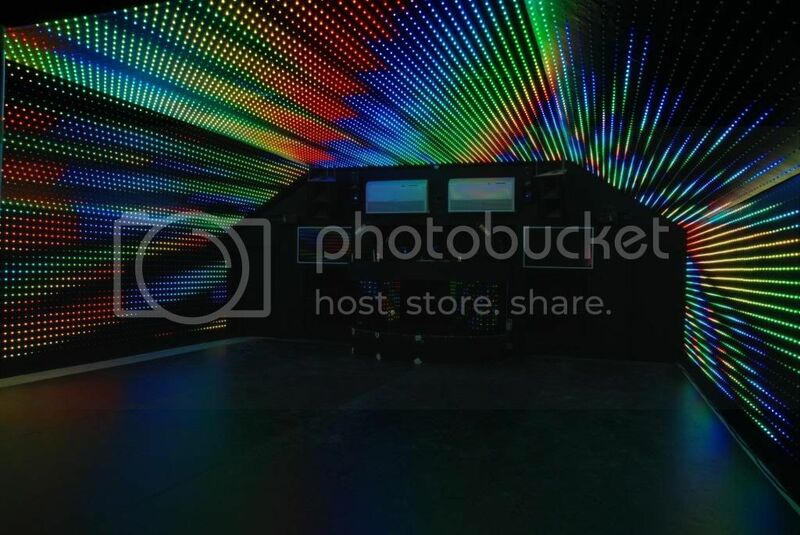 All of this at one of the best venues in London with over 15000 LEDs filling the main room and a sound system to blow you away! At SINISTRY:HALLOWEEN, London will be saying farewell to one of the true masters, KEVIN ENERGY! With a set in both rooms, expect some final fireworks from the man behind Nu Energy! This will be Kevin\'s final London performance so make sure you come down to give a massive send off to a proper legend! Also playing 2 sets on the night, we have international superstar PROTEUS! His main room set will be filled with the hard-hitting tracks that have seen him headline clubs the world over, along with his ridiculous energy behind the decks. For his appearance in the 2nd room, he\'ll be bringing you a special FINRG extreme set. Expect some seriously fast BPMs! This will be Proteus’ only appearance in London now until 2012 so make sure you don\'t miss the chance to experience one of the masters at work! Our other headliner is Hard Dance legend ROB TISSERA! Rob has been at the top of the Hard Dance scene for over 10 years and in that time has played some of the biggest nights on the planet! We\'re delighted to have him play for us at Sinistry and we know that all the Sinners will love his high energy style and cheeky re-edits! Also joining us will be Hard Trance hero PHIL REYNOLDS! Phil has played the biggest nights in the capital and continually wows crowds with his tight mixing style and uplifting tracks! Our 2 live sets are brought to you by ERYK ORPHEUS and EPHEXIS. Eryk\'s live sets are notorious in London so expect some Nu-Energy-influenced Hard Dance to get you stomping and a performance to match! Ephexis performed an amazing live set at the first ever Sinistry back in 2008 so it feels only right to get them back for SINISTRY:HALLOWEEN. The guys like to take things to a whole different level and reach some crazy BPMs by the end of their sets - you have been warned!!! Our 2 very special \"Versus\" sets see 2 of our Sinistry residents take on 2 established names in the scene. First up, it\'s ADAM LAB4 vs KOHL! This is a special one-off performance from ADAM and as both guys have a hard, industrial NRG sound, it\'s a set that\'s sure to bring some serious noise to proceedings! Secondly, we have FRISKY vs JESTER! This will be a Hardstyle showdown to savour as both have a style that\'s hard yet uplifting and is sure to have the Sinners stomping their hearts out! Closing proceedings will be one of London\'s hardest DJs - D4RK! Anyone who has seen D4RK perform will know what\'s in store! If you haven\'t, be prepared for some furious energy and some of the hardest tracks in the scene! (And perhaps a duck or two!) Again, you have been warned!!! Our 2nd room is dedicated to the Freeform sound. Alongside headliners KEVIN ENERGY, EPHEXIS & PROTEUS, ARKITECH will be showcasing tracks from his new label, DARWIN & SOLUTION will be going b2b for the very first time, while A.B., ENDEMIC, ADT COLLECTIVE and GREG PEAKS will also be on hand to take you through the best tracks the Freeform scene has to offer! Our hosts for selected sets will be SMYTHY, TEMPO, TRIGGER and SPECIAL G! ALSO ON THE NIGHT, THERE WILL BE A HALLOWEEN OUTFIT COMPETITION!!! THE BEST HALLOWEEN OUTIFTS WILL WIN PRIZES AND BE INTERVIEWED FOR THE OFFICIAL AFTER-MOVIE!!! AT SINISTRY WE\'RE ALL ABOUT HAVING FUN AND CREATING AN AMAZING RAVING ATMOSPHERE SO WE WANT TO SEE WHAT YOU CAN COME UP WITH! 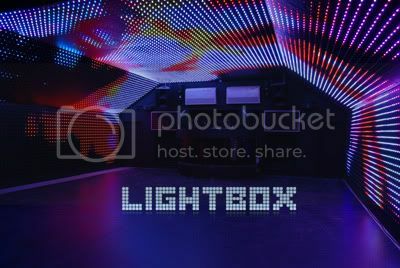 FANCY DRESS, HALLOWEEN THEMED CYBER, FETISH GEAR - ANYTHING AND EVERYTHING TO MAKE THIS THE BEST ATMOSPHERE AT ANY RAVE THIS YEAR! HOPEFULLY YOU SHARE OUR PASSION FOR ALL THINGS HARD AND WILL JOIN US FOR A HALLOWEEN PARTY TO REMEMBER! Keep an eye on the event page for interviews and promo mixes leading up the event!